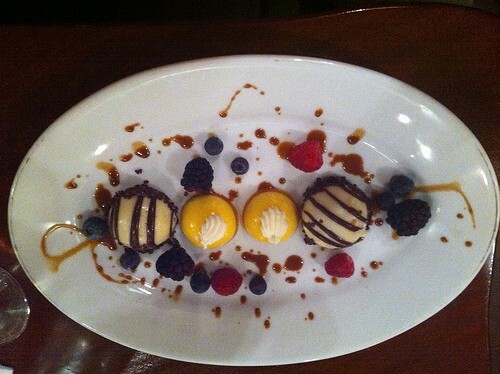 Zebra Dome desserts are one of the most popular not only in Disney Animal Kingdom Lodge Boma restaurant but in the whole of Walt Disney World. If you have dietary restrictions the good news is that Zebra Dome are available in a gluten free version. The picture above is the special gluten free version which my husband was served. Vegetarians and vegans beware – the recipe does contain gelatin so it is not vegetarian friendly. 6. Fold ? of whipped cream into the chocolate. 10. Place sponge circle (¼” thick yellow cake cut in a circle) on top. Leave in the freezer to set. The recipe does look very complicated and time consuming but for more experienced cooks out there I am sure it is worth a try! I have never tried this but for your vegetarians out there who do not want to use gelatin I would imagine that you can use agar agar as an alternative. For those of you who have not yet experienced the delights of Boma you really must try and dine at this fabulous buffet restaurant next time you visit the World. Once Boma was one of Disney World’s best kept secrets but these days it is getting more and more popular. Boma restaurant is located in Disney’s Animal Kingdom Lodge. Boma serves a breakfast and dinner buffet menu. Dinner is served between 4.30 and 9.30pm. Prices for Boma vary according to when you dine there (peak or regular season) and even which day of the week you dine there. Don’t you just wish that Disney restaurants would not do this? Anyway the adult price range for dinner is from $38.33 to $42.59 and for children (ages 3-9) the buffet is priced between $18.10 and $20.23. Taxes are included in these prices but gratuity is extra. You also get a standard non-alcoholic beverage.